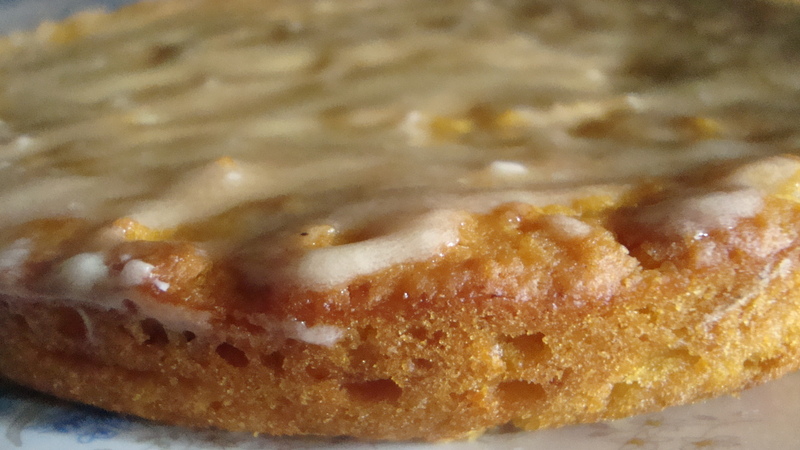 Last week, I had been planning to bake Poppy‘s delicious chai pear cake a second time but didn’t get around to it. 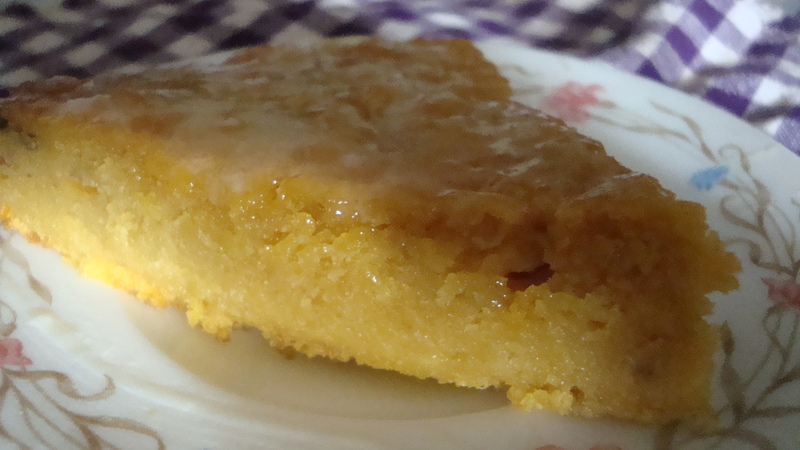 Finally, my mother rescued the pears and went ahead and baked me her lovely version of a pear citrus cake. So, today’s recipe is part of the fruit cake series. Chop up the pear and banana. Blend the pear and banana together with the cloves. Cream the sugar and margarine in a bowl. Whisk in the vanilla essence, banana essence, juice of one orange and lime and the blended pear and banana. Mix well. Add ¼ cup of water to the bowl and stir. Sift together the flour, baking powder and baking soda. Alternatively add the oats and flour mix to the bowl of wet ingredients, mixing it well so that there are no lumps. Transfer the cake batter to the baking tray and bake at 170⁰C/ 338⁰F the cake for about 45 mins to 1 hour. While the cake cools, make a simple icing by beating together ½ tbsp margarine with 2-3 tbsp icing sugar and 1 tsp lime juice. Spread the lime icing evenly over the cake. Slice and serve the pear banana citrus cake with a cup of coffee after a meal. For the past week or so, my mother has been baking a few varieties of fruit cakes using different fresh fruits. 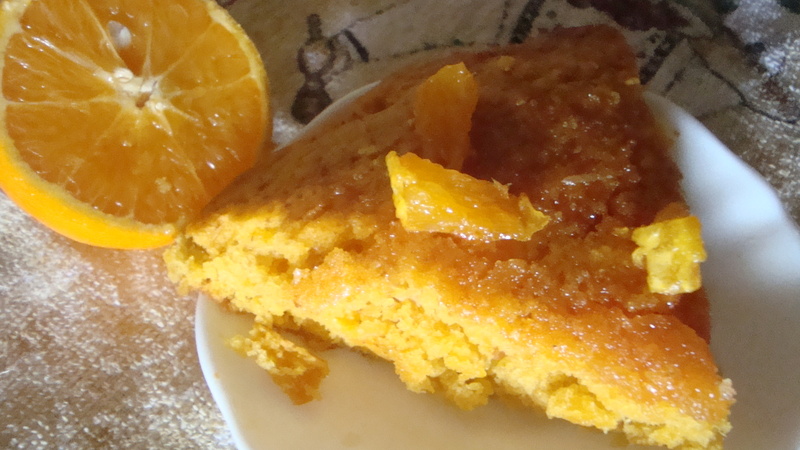 Today, I will share my mother’s recipe for her scrumptious orange cake, which is one of my new favourites. Wash the 2 oranges and then peel the oranges. Keep aside the two oranges to make orange juice. Take the orange peel, finely scraped or chopped and place them in a saucepan. Pour ¼ cup of water into the saucepan. Add 2 tbsp of sugar and a few drops of orange food colouring to the saucepan. Heat the orange rind sauce for about 5 mins until it thickens. Whisk the margarine and ½ cup of sugar in a mixing bowl. Add the orange rind sauce to the bowl. Add the whole grain oats to the bowl and stir. Make 1 cup of orange juice with the peeled oranges and the mandarin oranges. Stir in the orange juice into the bowl. Sift the flour together with the baking soda and baking powder. Gradually add the flour to the mixing bowl, ensuring that there are no lumps and the batter is smooth. Add a few drops of the orange food colouring to the bowl and mix well. 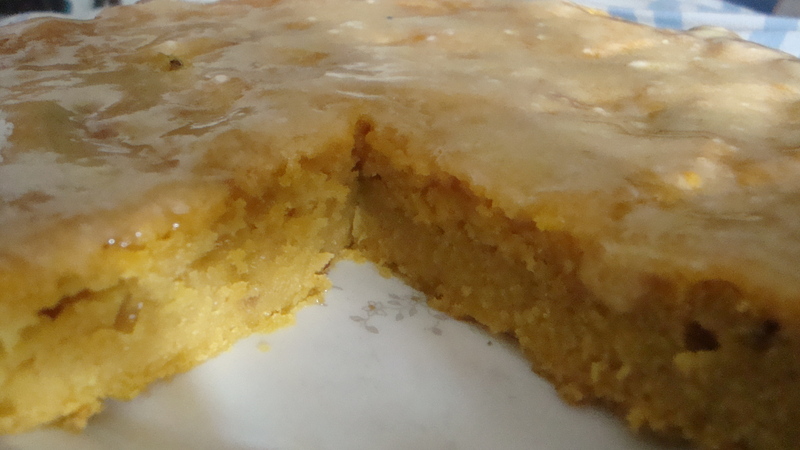 Transfer the cake batter to the baking tray and bake the orange cake at 170⁰C/338⁰F for 35 – 45 mins. 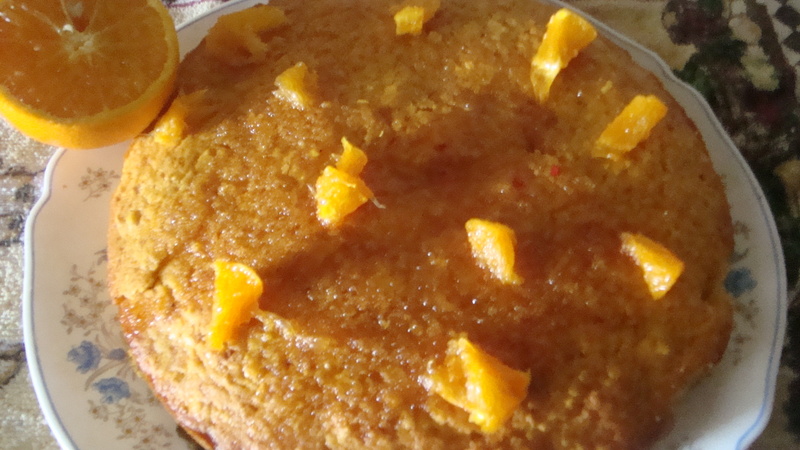 After the cake cools, either spread marmalade evenly on the top of the cake or else make an orange syrup to pour over the cake by heating pieces of oranges with 2 tbsp icing sugar over low heat. My mother has always been fascinated by the health benefits of different fruits and she has always tried to encourage my siblings and I to drink fresh fruit juices since we were kids. Based on her request, I will be sharing a few fruit juices, not for the recipe as they are very much straightforward blending, but because they are considered exceptionally healthy by her. Today’s fruit juice is papaya and orange juice. 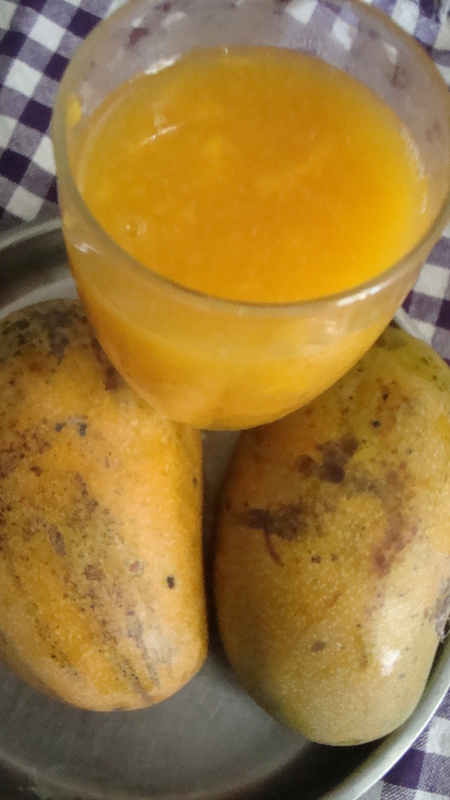 My mother has always been fond of papaya while I could not be persuaded to eat papaya for a very long time. The only way I would have papaya was when it was mixed with something else that I liked. 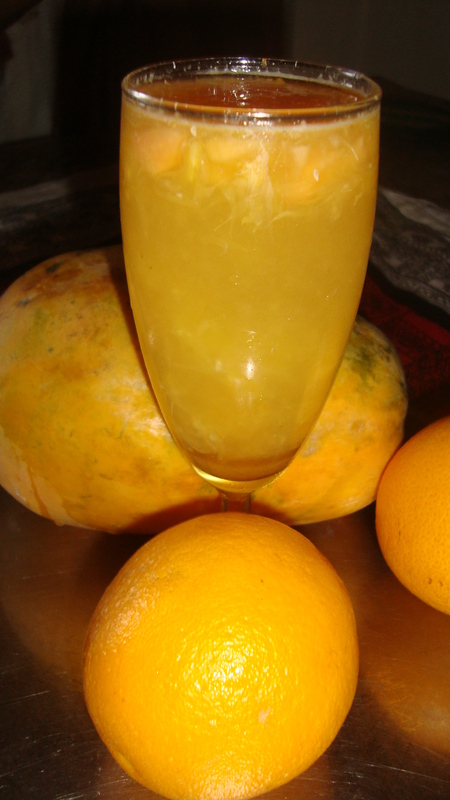 A papaya and orange mixed fruit juice was perfect. Papayas are supposedly good for people with diabetes as well as those with colon cancer, besides being a great fruit for the digestive system. Blend all three ingredients and serve (chilling is optional). Chop up the vegetables and fruits. 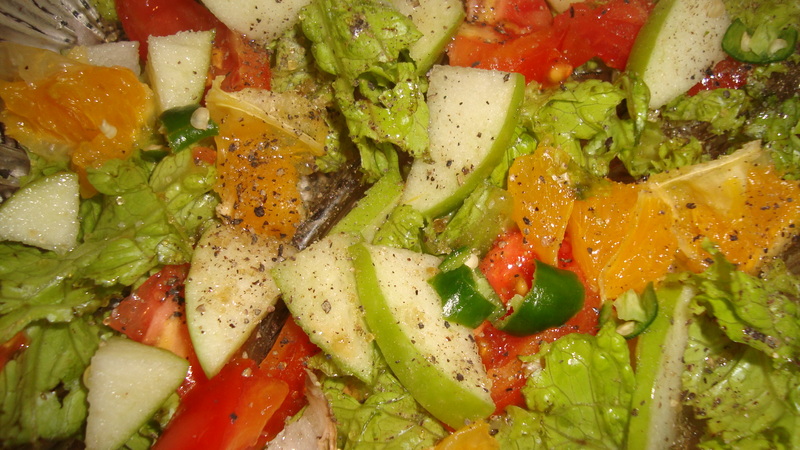 Make the salad dressing by mixing salt, pepper, sugar and lime juice.